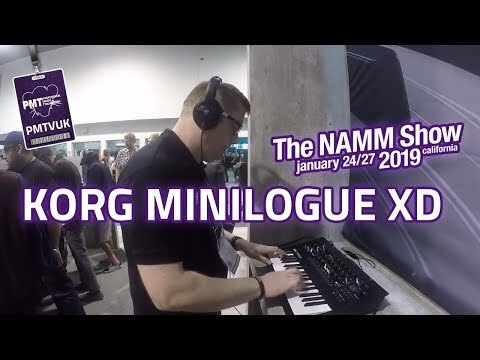 The Korg Minilogue XD is a next-gen poly synth that continues the Minilogue tradition of powerful performance and sound design pos.. The Korg Minilogue XD is a next-gen poly synth that continues the Minilogue tradition of powerful performance and sound design possibilities. The Analogue world meets Digital sounds for a truly hybrid synth. By adding a new Digital Multi Engine and 3rd oscillator, Step Sequencer and Micro-Tuning along with a new Stereo output, Minilogue XD emphasies the lush, rich analogue sound of the original Minilogue with all the extra trimmings to make it one of the best-in-class hybrid synths. The Minilogue XD preset sounds range from the warm pads typical of analog to fat basses and crisp lead sounds, covering every situation. XD also features deeper user customization and a 500 preset storage bank so you can build a massive library of custom sounds to draw inspiration from! 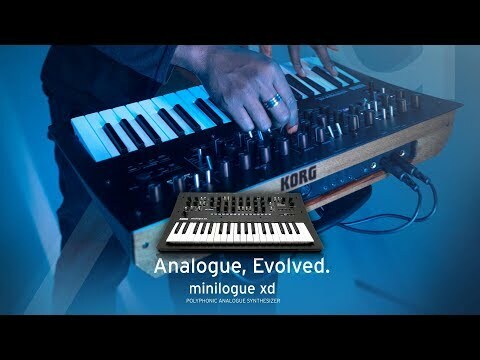 The Minilogue XD features four-voice polyphonic analog synthesis. The analog synthesizer circuit of the original Minilogue, whose powerful analog sound had a huge impact on the synth world, has been further developed for the Minilogue XD. Voice structure of Korg's Minilogue XD is 2VCO + MULTI ENGINE, 1VCF, 2EG, 1VCA, and 1LFO. In addition to the distinctive circuits found in the series, such as wave shaping to shape the overtones of the oscillator and a sync/ring switch, there's also cross modulation, a sharp two-pole filter, and a drive switch that adds thickness and drives signal into Minilogue XD’s filter. A new addition to the Korg Minilogue XD! The Digital Multi Engine offers a 3rd oscillator, in addition to the 2 analogue VCOs, for deep and varied sound creation possibilities. The digital engine consists of 3 sound generators - a Noise generator, VPM and a User Slot. VPM Oscillator: Variable Phase Modulation/FM oscillator with 16 Oscillator Types and SHAPE knob control. Ideal for sharp, metallic sounds with complex overtones. User Oscillators: Load your own oscillator programs available online or saved under the hood of Minilogue XD. 16 User Slots. By combining analogue and digital sound engines, you begin to unleash a new sonic character for sounds that utilise the best of both worlds. Minilogue XD’s high-quality digital effects use 32-bit floating point DSP processing, adding a finishing touch to its deep sound design platform. The three types (modulation effects, reverb, and delay) can be used simultaneously, letting you choose from a wide range of variations including chorus, ensemble, warm tape delay, and a diverse variety of reverb. The step sequencer provides 16 steps, and supports both realtime recording and step recording. You can use the 16 step buttons to select a step directly, allowing quick editing to replace the pitch of a step or to mute it, or even improvisatory performances. Motion sequence lets you record the movements of up to four knobs, adding time-varying change to the sound, and you can record not only smooth changes in value but also values that change precisely at each step. You can use this to design the sound differently at each step; for example, you might create a drum pattern or sound effect from just a single program. As well as 200 preset sounds in the unit, Minilogue XD has been designed as a fully customizable, open sound design environment. You can store and save up to 500 presets in total. It comes with 16 user oscillator slots, and 16 user effect slots you can overwrite and edit. Korg's SDK (Software Development Kit) can be loaded via the dedicated librarian software for even deeper preset control. The Minilogue XD now benefits from a brand new Stereo output. This works synonymously with the DSP effects and new sound engine to provide a much wider, spacious sound from each oscillator. Minilogue XD also features 2 x CV IN jacks great for tweaking input modulation signals and using external devices to control synth parameters on the Minilogue itself.